Simplify all the stuff in your life, beginning with kids labels! As parents ourselves, we know what a challenge it can be to keep track of all your child’s belongings. Without personalized name labels for kids’s clothes, backpacks, lunch boxes, and more, all those valuable items can easily get mislaid at school, daycare or camp. It’s Mine! offers an extensive range of personalized clothing labels for kids, and other products, that will help keep your child’s things out of the Lost and Found! As parents, we know what a challenge it can be to keep track of all your kids clothing, especially if you have multiple children. Labeling children’s clothing will help you stay organized and ensure that each kid has the correct clothes. When school is in session name labels help keep your child from losing their clothes at school. Without personalized name labels for kids, valuable clothes, backpacks, lunch boxes, sports equipment and more, can easily get misplaced at school, daycare or camp. We have iron on labels and sew on labels for clothing, waterproof stick on labels for lunchboxes and books, stick on labels for clothes, and more! You don’t need to worry if you’re not the craftiest person, our labels are application friendly. It’s Mine! 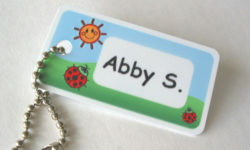 offers an extensive range of personalized name labels for kids that will help keep your child’s things out of the Lost and Found! Browse and shop our wonderful selection of kids labels below, to see which type of label would best suit your purposes. Click on the name of the label that interests you, to access the relevant product page, where you can view all styles, colors and fonts, and place an order. For more information, including shipping costs and delivery times, please visit our Questions page. Durable – will stay on in the dishwasher, microwave, etc. Ideal for backpacks, sports bags, instrument cases, etc.